This was the last of Amsterdam's large-scale overspill developments, in which the 'urban design philosophy of 1930 and technical know-how of 1965' were to produce 'a city for the year 2000'. 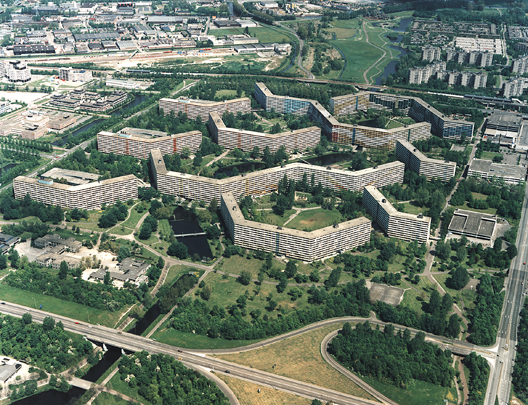 Identical high-rise slabs in a honeycomb pattern stand amidst parkland intersected by main roads and a Metro. There was criticism and negative publicity in abundance even during its construction and the area has been plagued by disuse and vandalism from the word go. Many optimistic proposals and sprucings-up later, it was finally decided to renovate the communal courtyards, partially demolish the more troublesome flats and densify the area with low-rise.